Just when you thought you’d explored every realm of digital, the landscape has changed yet again. With online and mobile sales expected to account for almost 40% of overall sales by 2018, the pressure is on for your digital channels to drive revenue. Is your organisation prepared for this dramatic three-year increase? In the past, it made sense to make changes incrementally. But given the new digital age, where the consumer is more mobile than ever before, the safest bet for marketers now is to go all in. It’s now or never to invest in the people, processes and technology that will fuel your digital transformation. 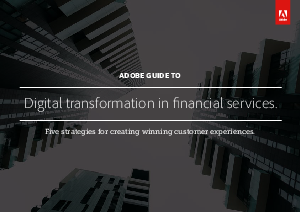 This eBook explores the five strategies for creating winning customer experiences.